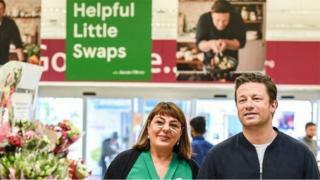 Chef and author Jamie Oliver is teaming up with Tesco for the first time to promote the company's food products. He has created a series of recipes and tips for Tesco, which will include "healthier" recipes from scratch. His fee has not been disclosed. Mr Oliver earned more than £10m from a previous 11-year deal with rival store chain Sainsbury, which ended in 2011. His restaurants, in common with many other High Street chains, have been closing branches to curb costs. In an interview with the Financial Times newspaper last week, he revealed he had put £13m of his own money into his Jamie's Italian restaurant business. Last month, Mr Oliver said he was considering selling his Barbecoa steakhouses and he is in the process of shutting about a third of his Jamie's Italian outlets as part of a rescue plan with creditors that would enable it to continue trading. Tesco, the UK's biggest supermarket, said the campaign would see Mr Oliver promote "helpful little swaps" in stores, suggesting healthier alternatives with reduced levels of sugar, salt and fat. The retailer said a basket of these swaps would cost about 12% less than a regular basket. Independent retail adviser, Richard Hyman, said the tie-up was unlikely to bring in many new customers, but added that this was not necessarily the intention: "It's a positive move but not a game changer. "I'm not sure there's any single thing that is a game changer in what is a vastly rougher game than ever. What it does do is provide reassurance to customers, like celebrities do in fashion retailing. And he will help draw existing customers to a broader range of products." Jamie Oliver left school with just two GCSEs but was "discovered" by a film crew while working at the River Cafe restaurant in west London. His Naked Chef TV series in 1999 made him a household name and he has written more than 20 books. He has campaigned on a number of health issues, including school meals and battery farmed chickens and eggs, and he was awarded an MBE in 2003.